Negative reviews may be one of the most frustrating experiences for a doctor. From a patient unhappy with the front desk staff, the parking situation, the price of their Rx, to the amount of one-on-one time with the doctor, unrealistic treatment expectations, or just because the patient is having a bad day. In today’s world your online reputation is critical, especially for doctors in the aesthetic field or out-of-network. The solution? I highly recommend you devise a well-thought digital strategy that ensures your online reputation is an accurate representation of your practice. The most important review sites are Google and Yelp. Otherwise anything that ranks on page 1 of Google when you search your name or your practice name, including HealthGrades, Vitals, and RateMDs. If you are in aesthetics, RealSelf should be high on your list. If you’re on social media, don’t forget Facebook. The goal should be at least 50 reviews on Google and Yelp. The more reviews you have, the less impactful a future negative review may be, and you will receive a higher rank in organic search results. Devise a strategy to motivate satisfied patients to leave online reviews. Generally, a happy patient will tell their friends or family about you. But, how do you persuade them to share their experience online? The absolute best strategy is for the doctor themselves to ask. Blame it on your marketing company, blame it on your practice manager, but do whatever it takes. It may not be fun and may feel a bit awkward, but a verbal request, phrased carefully from the doctor, goes a long way. The verbal request should be followed up with something in writing. It could be a card to hand out, a text, or an email sent after the patient leaves the office. The most important thing to remember is the review must be left from outside of the office (ie, a different IP address to avoid it from getting removed or filtered). If your patient is not a “Yelper”, their review on Yelp has a good chance of getting filtered (ie, not showing on the main page or being a part of the overall star rating). Regardless, if they can ‘check-in’ on Yelp from your office, have a profile picture, have friends on Yelp, and have multiple reviews, there is a higher likelihood of the review “sticking”. Another example is Google reviews. They are quite easy to post for anyone with an @gmail.com email address. RealSelf reviews can now be left right from the office, which makes it as easy as using an iPad right at the front desk. All in all, I can promise you that nothing is better than the doctor/practitioner themselves asking for the review. Next, you need to deal with the current negative reviews and work to prevent future unhappy patients from going online to post negative comments. For current negative reviews on certain sites you can “flag” them and argue your case. Be careful to argue only against something that conflicts with the site’s content or user guidelines. Just being untrue or not a real patient is not an effective argument. You may respond privately and/or publicly depending on the site guidelines. I recommend taking the high road and not be argumentative. Thank the reviewer for the feedback and describe how you made improvements based on their input and encourage them to re-visit and have an even better experience based on what you learned from them. To help prevent unhappy reviews, you must give patients a safe place to vent. This can be something as simple as an anonymous patient satisfaction survey or follow-up customer service calls. Another perk of a follow-up customer service call is, if the patient is happy, you may solicit a positive review from them. Yelp and Google are both powerful platforms that must be heeded in today’s digital world. Everyone may get a bad review eventually, so go on the offensive with a proactive comprehensive strategy. Your online reputation is just one piece of an effective overall marketing strategy. So, integrate your plan of attack with your overall marketing plan. 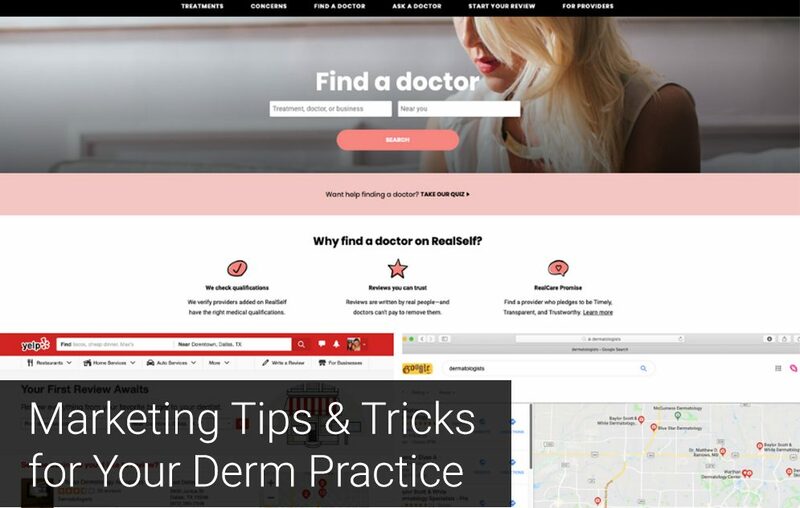 Marketing Tips & Tricks for Your Derm Practice is a series written by Risa Goldman Luksa of Goldman Marketing Group that covers development strategies to help practitioners attract and maintain patient loyalty. You can reach Risa at [email protected].